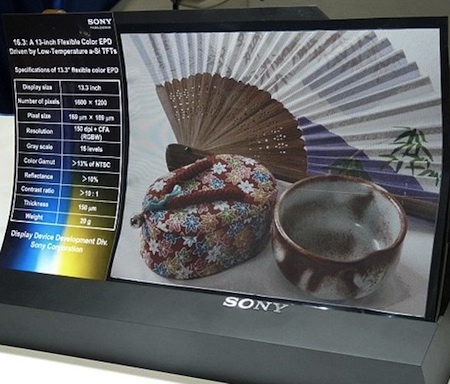 Sony's flexible e-color display is just 150 microns thick; the 13.3 inch display weighs 20 grams. Frankly, I think it is odd that a piece of paper should be measured on the diagonal. Even if it is e-paper. The display’s 800 x 1200 pixel array consists of red, green, blue, and white sub-pixels. The sub-pixel measures 169 microns x 169 microns and the resolution and gradation of the screen are 75ppi and 16, respectively. Via Physorg; also, take a look at the 29 different technological ideas from The Diamond Age.